Intercités are the classic long-distance trains that operated throughout France prior to the introduction of the high-speed TGV network. These trains serve long-distance lines in areas that are not yet served by high-speed lines. Intercités trains are slower, but are also a safe, comfortable and scenic way to travel and are preferred by most travellers that use rail passes such as the Eurail and InterRail pass. The big advantage for rail pass holders is that most Intercités services (with a few exceptions such as night trains and some international services) do not charge compulsory seat reservation fees to people travelling with Eurail and InterRail passes. 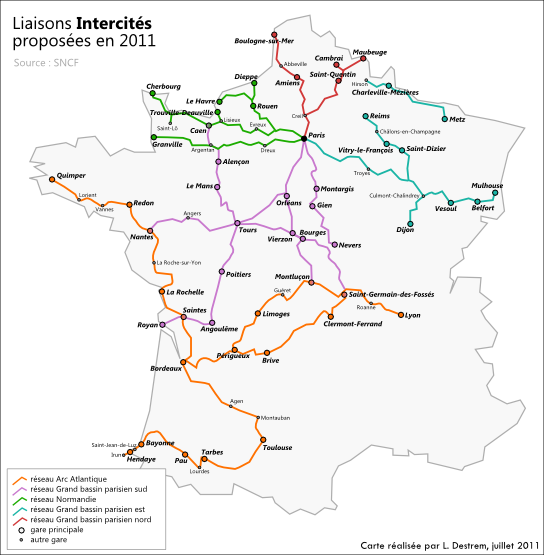 There are no classic Intercités rail services in the Rhône-Alpes, Provence-Alpes-Côte d’Azur and Languedec-Roussillon regions as high-speed lines are well developed in this part of France with a close integration between the high-speed TGV and regional TER services.